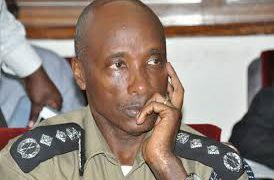 The Chieftancy of Millitary intelligence (CMI) has today slapped a fresh charge of being in unlawful possession of ammunitions against 7 senior police officers who are on trial for kidnapping 3 Rwandese nationals . The new charge is contained in an amended charge sheet presented before the General Court Martial this afternoon by army prosecutor Maj. Rapheal Mugisha. CMI states that on the October 24, 2017 at Najeera within Kiira Division in Wakiso District , the seven police officers together with two civillians were found in unlawful possession of four grenades which are ordinarily a monopoly of the UPDF. Only SPC Joel Aguma, SSP Nixon Agasirwe Karuhanga, D/ASP James Magada, D/AIP Benon Atwebembeirwe, D/Sgt Abel Tumukunde , D/CPL Amon Kwarisima and a one Bahati Mugenga were present in court since the rest of the accused were released on bail . Of these, only Nixon Agasirwe has taken a plea of not guilty but the rest have refused to subject themselves to the jurisdiction of the court martial. The accused were arrested in September last year and charged with kidnapping Joel Mutabazi and Jackson Kaleemera on October 25, 2013 at Kamengo in Mpigi District and allegedly deported them to their country against their will. 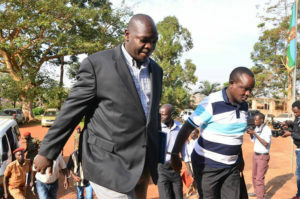 Agasirwe, Aguma and their co-accused have been remanded back at Luzira prison and Makindye police Millitary barracks February 27, as investigations continue.